Bubby and Bean ::: Living Creatively: GIVEAWAY // Win a $75 Shop Credit to Runaway Pony! GIVEAWAY // Win a $75 Shop Credit to Runaway Pony! Today I'm teaming up with June's featured sponsor, Runaway Pony, to bring you guys what is quite possibly the most adorable giveaway we've ever run. Founded by designer Dian McManus (also mom to two little girls named Keira and Fiona), Los Angeles-based Runaway Pony features absolutely beautiful handmade vintage-inspired children’s clothing. Dian says that the line is a reflection of the classic American childhood, and celebrates the innocence of children through age-appropriate yet sophisticated designs with to-die-for embellishments and distinct details. From elegant little dresses with lovely trims to sweet sunsuits and rompers full of lace and bows to playful overalls with loads of buttons and pockets, the attention to detail of each colorful piece is evident. Essley has a Runaway Pony piece on the way and I can't wait for her to wear it! 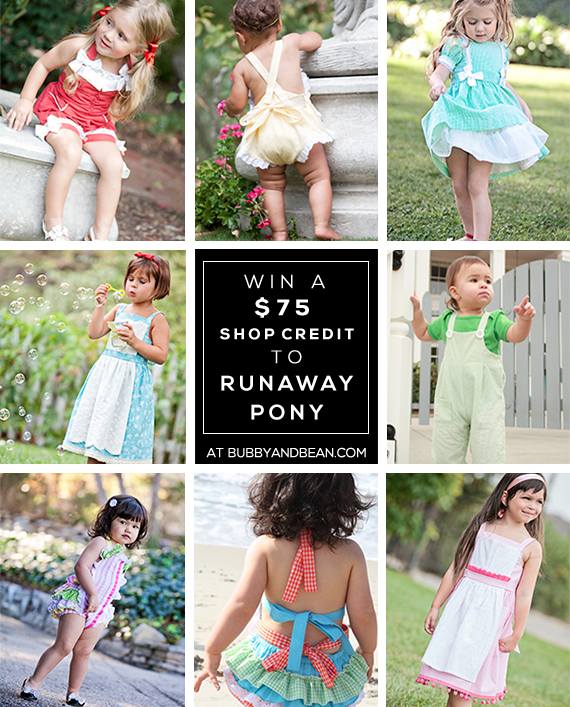 And now for the best part: one lucky Bubby and Bean reader will win a $75 shop credit to go shopping on Runaway Pony's website! Whether you have kids of your own, have nieces/nephews, have grandkids, have friends with kids, or have friends who are kids, this giveaway is for you! This giveaway is open to Bubby and Bean followers/subscribers through GFC or Bloglovin'. To enter, just use the Rafflecopter entry form below. You can gain up to 14 entries! This giveaway will run through July 3rd, 2014 and is open to Bubby and Bean readers worldwide. The winner will be randomly chosen and announced here shortly after. Thanks again to the wonderful Dian over at Runaway Pony for giving Bubby and Bean readers the chance to win a store credit to her beautiful shop! Good luck! Pecan Puff Dress in Green Gingham with Laces and Bows is amazingly adorable. Thanks for the giveaway! My favorite item is the Strawberry Sundae Romper in red. So cute! WE can't get over how cute all of Runaway Pony's collection is. We personally own their Sugar & Milk Sunsuit with Ruffles & Bows in Candy Pink-White Stripes and truly love it! It's extremely comfortable, kid proof and super duper easy to clean. We literally get stopped by strangers asking us where we got it and of course without hesitation I refer them to Runaway Pony's website. I mean how can you not! Everything is tooooooooooooo DIE for! I like the pecan Puff dress in green gingham. Omg, such cute clothing! I love the Strawberry Sundae Romper in Teal and Orange Dots. I've been loving rompers for my daughter because she can look cute and still run around and play. Wow! How adorable are these vintage-inspired threads??? Love the rompers. Oh-so-cute!!! Thanks so much for the chance! I love that the clothing is made in California too. Wootwoot! These clothes are adorable. I am a GFC Follower as : Stephanie Gossett. My little Gwen would look scrumptious in the Pecan Puff Dress in Green Gingham with Laces and Bows. Thank you for the chance! Tiny tots deserve vintage inspired pieces too! Love the sunsuits and striped romper! My daughter would definitely love the shortbread cookie dress. The built in apron is so cute! I can't even tell you how much I LOVE the Peppermint Lollipop in Red and Royal Blue Crab Seersucker outfit. A must have for the beach! Pecan Pouf, second to the Strawberry Sundae! I lurve the Pecan Puff Dress in Green Gingham with Laces and Bows. So pretty! Cute!!! The sugar and milk sunsuit is to die for! I think the Strawberry Sundae Romper in Red with White Polka Dots & Bows is absolutely ADORABLE! Oh my heavens... my heart literally sighed when I saw the Sunkissed Sally Sunsuit in Yellow with White Dots suite!! I am in mad love with this shop! Thanks bunches for the sweet chance! My daughter would look adorable wearing the Sugar & Milk Sunsuit with Ruffles & Bows in Candy Pink-White Stripes! I love the peppermint lollipop overalls! I would love the Strawberry Sundae Romper in Red with White Polka Dots and Bows for my daughter. Also love all the Sunsuits, Super Cute! I'm loving the Shortbread Cookie Dress with Apron in Floral Vintage Blue! The shortbread cookie dress is adorable!! My niece would look absolutely adorable in the Sunkissed Sally Sunsuit in Yellow with White Dots! I really like the sunkissed sally sunsuits! I think the peppermint lollipop overalls are my fave! I love the boy overalls! I absolutely love the Shortbread Cookie Dress with Apron in Floral Vintage Blue! Love the Pecan puff dress, so cute. my favorite item is the Shortbread Cookie Dress with Apron in Floral Vintage Blue . it was all super cute though. I love the Shortbread Cookie Dress with Apron in pink! Shortbread Cookie Dress with Apron in Floral Vintage Blue is my favorite! I love the peppermint lollipop in green seersucker overalls! So darling. I love the Pecan Puff Dress in Green. I love the blue shortbread cookie dress! I LOVE the Strawberry Sundae Romper! Omg! The Sugar & Milk Sunsuit with Ruffles & Bows in Sky Blue is one of the cutest things I've ever seen! I think the Strawberry Sundae Romper in Red with White Polka Dots & Bows is just to cute. And so are your models! Pecan Puff Dress in Green Gingham with Laces and Bows is adorable. The Pecan Puff Dress in Green Gingham with Laces and Bows is too precious! So perfect for a little girl! I love dresses and they have 3 t choose from. My favorite is the Pecan Puff Dress in Green with the sweet little bows. Oh my, here's another vote for the Pecan Puff Dress in Green Gingham with Laces and Bows ~ You just can't get any cuter than that! My favorite item is the Sunkissed Sally Sunsuit in Yellow with White Dots. What a wonderful store with a great selections!! it's hard to find a favorite! Thank you bubbyandbean fdr the chance and the generosity for always making the giveaways internationally. Been a long time IG follower! Thank you SO much for all of your lovely comments on our collection! :) We are so happy to hear that you like our pieces! New designs are also coming soon! Congratulations to the winner!!! :) Thank you SO much to the wonderful Bubby and Bean for hosting this giveaway! We love you all!